Windows has a very helpful feature of drag and drop for copy-pasting files. To perform this operation you have to open two explorer windows and keep it open side by side on your desktop. The first explorer window is the one where the file you want to copy is located and the second window is the one where you want to paste the copied file. Then click on the file you want to copy and without releasing the mouse button, drag the file into the other. Most people use this and is the quickest way to copy paste files. However, there are several difficulties in using this feature: you have to open two windows at the same time and you can't maximise either of them. To circumvent this obvious disadvantage a new interaction technique was developed called Fold n' Drop. Fold n' Drop uses an extremely intelligent technique for seamlessly dragging and dropping between overlapping windows. It allows you to fold windows while dragging objects and then drop them into windows behind them. 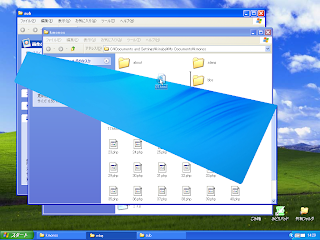 Fold n' Drop uses mouse gestures to fold windows and drop objects. You can try a demo on how Fold n' Drop works. Download this java (.jar 65kb) file and run it. Then use these mouse gestures to interact with the folders and files in the demo. Cool, isn't it? There are also a few videos of this process available on their website. Ok. So how do we use it in Windows? There is tool called OriMado that has implemented Fold n' Drop to enable you to carry out drag-n-drop function without having to rearrange open windows. There is a nice demonstration on how to use this tool on the homepage. I'm sure you will love this. You can just drag your items down towards the task-bar, then hover over the icon of the program you want to 'drop' on. The program will come to the foreground. Or, you can hit 'ctrl-c', switch windows, then hit 'ctrl-v'. Fold n'Drop may be a solution looking for a problem, perhaps...? Yes, that's one way of doing it. But did you try that java demo? It looked so cool, that I couldn't help posting it.